This article expands on the discussion of shipping-related issues in a report by the Institute for China-America Studies, “China’s Interests in the Arctic: Opportunities and Challenges” (March 2018). China issued its first official Arctic policy in a white paper published on January 26, 2018. The Chinese media and academics were truly thrilled—both by the content of the policy and by the fact that it had been formalized and published—and reacted immediately with overwhelmingly positive reporting and analysis. Meanwhile, the international community, especially the Arctic states, quickly added their views on the white paper. Of the Arctic five (the five states with a coast inside the Arctic circle), Canada is the most concerned about the white paper’s implications. Canadian experts warn that China’s Arctic policy is attempting to tread a fine line between respecting the sovereignty of Arctic nations and leaving room to profit from disputes in international law. The white paper’s use of language like “respect for international law” is viewed by Robert Huebert from the University of Calgary and Frédéric Lasserre from Université Laval as an attempt to articulate limits on Arctic states’ sovereignty. One of the issues that worries Canada the most is whether China will adopt the same legal position as the United States and the European Union: treating the Northwest Passage as a “strait for international use,” in opposition to Canada’s claim to it as “internal waters.” In fact, this essay shows that the white paper largely avoids this difficult issue, focusing instead on the considerable opportunities and challenges posed by economic and environmental considerations. 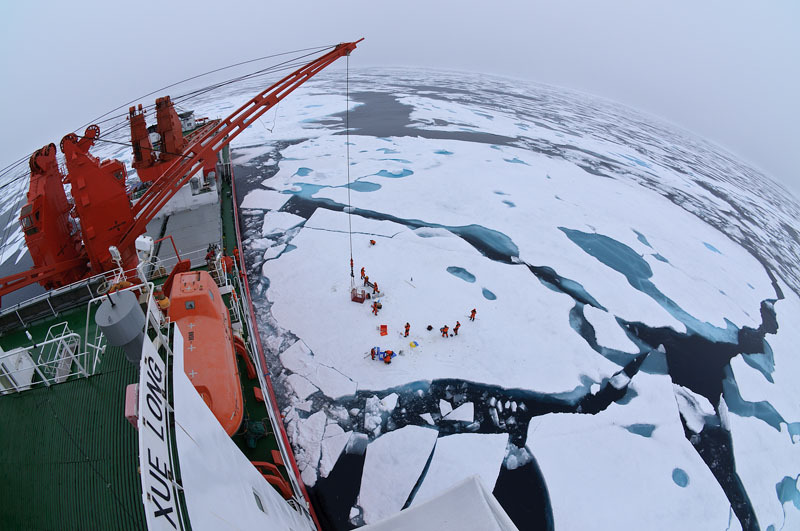 Camp in the Arctic Ocean as seen in July 2010 from the deck of Chinese icebreaker Xuelong. Creative Commons/Timo Malo. As Donald Rothwell notes, the legal status of the Northwest Passage as a shipping route “was relatively uncontroversial for much of the 20th Century,” primarily due to the lack of interest in commercial navigation through the passage as a result of challenges associated with ice conditions. In 1969, the voyage of the SS Manhattan, an icebreaking supertanker, from the Beaufort Sea through the Northwest Passage to the Davis Strait changed the situation. Canada perceived the United States as ignoring its sovereignty by conducting these voyages through “Canadian waters.” Faced with public pressure to reaffirm that sovereignty, Canada adopted a number of measures, including enactment of the Arctic Waters Pollution Prevention Act, the extension of the Canadian territorial sea from 3 to 12 nautical miles, and the modification of Canada’s acceptance of the compulsory jurisdiction of the International Court of Justice, which placed a bar on any attempt by the United States to challenge Canada’s actions before the court with regard to the Arctic. The United States considered the Manhattan voyage “an exercise of navigational rights and freedoms not requiring prior notification.” From the U.S. perspective, shipping and navigation are critical to the economic development of Alaska, and U.S. strategic interests across the Arctic as a whole also rely heavily on the concept of freedom of navigation. The legal status of the Northwest Passage has been the subject of disagreement between Canada and the United States ever since then. In recent decades, the two sides have reached an understanding regarding their respective positions. 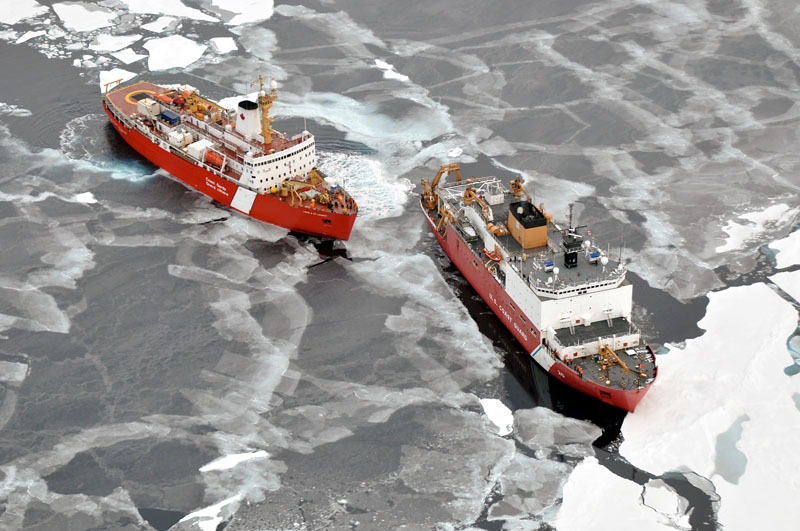 The 1988 Agreement on Arctic Cooperation stipulates that the Unites States, without compromising its legal position on the status of the Northwest Passage, must seek Canadian consent for icebreaker navigation through the passage. However, as the route becomes increasingly free of ice, eventually the United States might wish to reassert a more robust position on freedom of navigation. Map of the Arctic region showing key shipping routes and bathymetry. Arctic Council. Other than the long-standing objections raised by the United States and echoed by the EU, Canada’s position has not been challenged by other states that also recognize the importance of shipping through the Arctic. China, Japan, and South Korea, in particular, see the melting Arctic Ocean as a unique opportunity for international trade, which will have a measurable effect on their economies because of their dependence on shipping. In addition, over the past decade a growing number of cruise ships have sought to transit the Northwest Passage. The positions of China and other non-Arctic states on the legal status of the Northwest Passage and the Northern Sea Route will be crucial for the Arctic littoral states. 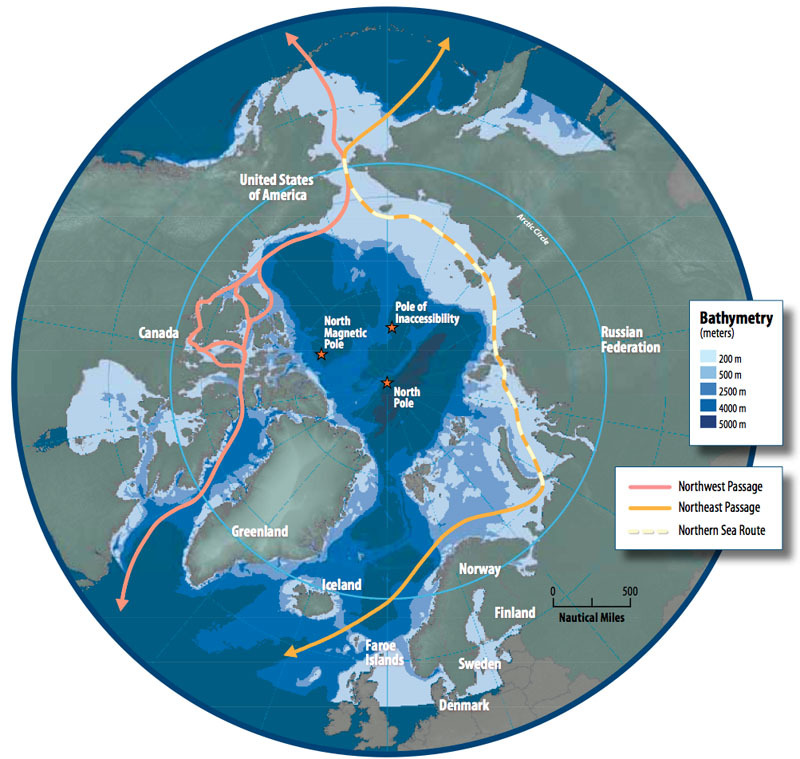 Sooner or later, non-Arctic states will have to adopt a clear position on whether the Northwest Passage and Northern Sea Route enjoy the status of international waters for navigation, as the United States and the EU hold, or whether they are internal waters, as Canada and Russia insist. In its white paper, China maintains that all activities to explore and utilize the Arctic should be conducted in compliance with treaties such as the United Nations Convention on the Law of the Sea (UNCLOS) and the Svalbard Treaty, as well as with general international law. However, the white paper does not touch on the status of the Northwest Passage and other straits in the Arctic. On shipping, China expresses a desire “to work with all parties to build a ‘Polar Silk Road’ through developing the Arctic shipping routes.” China encourages its enterprises to participate in infrastructure construction along these routes and to “conduct commercial trial voyages,” in accordance with international law, to pave the way for regular commercial operations. In addition to emphasizing opportunities for commercial shipping, the white paper offers evidence of China’s interest in supporting and encouraging cooperation with Arctic states to develop tourism in the region and calls for concerted efforts to enhance security, insurance, and rescue systems. Canadian and U.S. coast guard vessels in the Arctic on September 5, 2009. NOAA/Pablo Clemente-Colon. One consideration that might weigh against China following the lead of the United States and EU on the Northwest Passage is that doing so would weaken the argument that its own Qiongzhou Strait, between Hainan and continental China, should be considered internal waters. It is worth noting, however, that the status of the Qiongzhou Strait has rarely, if ever, been a matter of debate, while the status of the Northwest Passage and the Northern Sea Route has frequently been contested. In addition to the unsettled status of the Arctic routes under the special legal navigation regime of UNCLOS, the growth in Arctic shipping has increasingly shone a spotlight on other legal issues involving maritime security in the Arctic. One development has been the adoption of legally binding instruments for dealing with matters of mutual concern among the members of the Arctic Council, including the 2011 Arctic Search and Rescue Agreement, the 2013 Agreement on Cooperation on Marine Oil Pollution Preparedness and Response, and the 2017 Agreement on Enhancing International Arctic Scientific Cooperation. Moving beyond legal challenges, economic value is another key factor to bear in mind for future commercial shipping through the Arctic. Although the technology already exists to design vessels that could operate year-round in the Arctic, such activity simply does not yet make economic sense. The cost savings of exploiting the shorter route could be considerable, but may be offset by increased costs for labor and marine insurance. Furthermore, given the challenge of making predictions about supply and demand, it is difficult to accurately weigh the economic variables in shipping costs. Setting aside these jurisdictional and economic issues, as shipping traffic increases, the possibility of damage to the fragile Arctic marine environment will also increase. The accidental spillage of oil and chemicals due to shipping activities is perhaps the greatest concern. As the Exxon Valdez grounding demonstrates, large oil spills can have a lasting impact on the local marine environment. The level of concern has been elevated as a result of the blowout in the Gulf of Mexico in April 2010 and regular media coverage of oil spills from shipping accidents that occur worldwide. Considering the added challenges of operating in the Arctic, the risk of accidents may increase there. Even worse, there are presently very few ways of recovering spilt oil from ice-covered waters. These factors need to be addressed in order to avoid severe ecological and economic consequences. 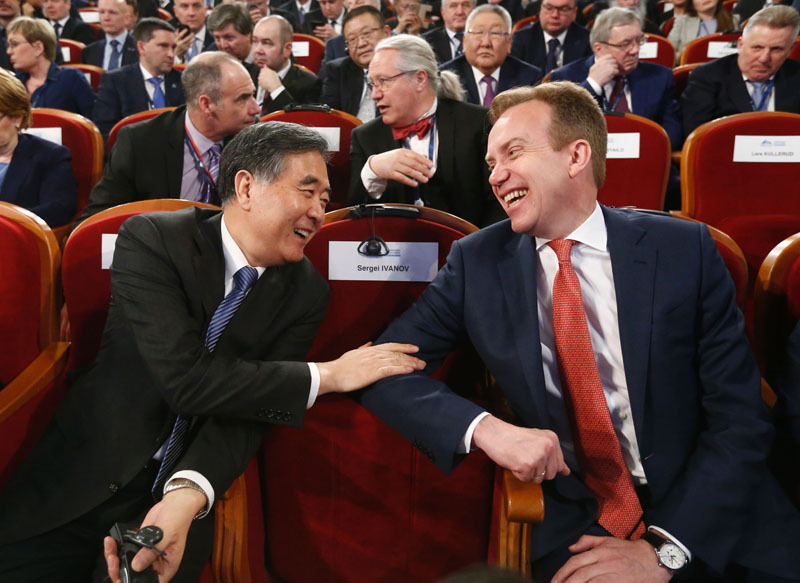 Chinese Vice Premier Wang Yang (L) talks to Norwegian Foreign Minister Borge Brende at the International Arctic Forum in Arkhangelsk, Russia, on March 30, 2017. Sergei Karpukhin/AFP/Getty Images. Other equally important environmental concerns include the introduction of invasive marine species through ballast water discharges and the need for rigorous control of ships’ garbage and waste products. Even carefully controlled shipping can cause unintended damage to wildlife if the shipping routes run through areas of critical environmental concern, such as whale foraging zones and migration corridors. Ship strikes are already one of the most significant threats to the survival of the North Atlantic right whale. Indeed, most of the environmental dangers posed by shipping activities are not due to accidents—like the large-scale oil spills that catch the media’s attention—but rather to routine operations. Increased shipping in the Arctic must be conducted in an environmentally sound fashion. But environmentally sound shipping can only be accomplished with the help of an international agreement between all parties engaged in shipping in northern waters. Like its neighbors in East Asia, China sees the melting Arctic Ocean as a unique opportunity for itself and international trade generally. Its recently published white paper on Arctic policy highlights the country’s interest in shipping routes through the Arctic, among other interests such as participating in Arctic governance and polar research. On the one hand, the international community, including Arctic Council members, welcomes the transparency and increasing confidence that China shows by participating in Arctic governance. On the other hand, given China’s rapid military modernization and economic growth, suspicions regarding its global strategic intentions as it moves toward the Arctic are unavoidable. Canada’s concerns about China’s evolving position on the status of the Northwest Passage are symptomatic of this dilemma. Thus, a combination of potential economic benefits, unsettled legal issues concerning the navigation regime in the Arctic, and technological and environmental challenges will likely determine the prospects for China’s involvement in Arctic shipping. Banner Image: © STR/AFP/Getty Images. The Chinese icebreaker Xuelong at port in Shanghai on November 8, 2017.